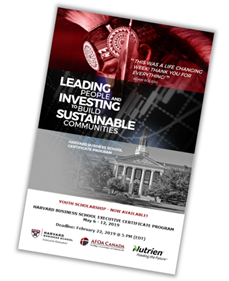 AFOA Canada and Nutrien have come together to sponsor one (1) youth between the ages of 22 & 29 to attend Harvard Business School. This unique program is for senior administrators, executive officers, elected leaders and senior managers working in Indigenous communities; urban, rural organizations and isolated settings; and on and off-reserve. Scholarship package includes travel, accommodations and meal expenses will be covered in accordance with Treasury Board Guidelines.